It is important that the Wu Style form be displayed with its inherent martial applications, otherwise it becomes a purposeless waving of the arms. The form will look best to onlookers if it contains the inherent meaning or spirit of the martial art moves. The only way to understand its applications is to spend time with a partner and practice them. On first inspection, the short form may appear simple with one application per form. However, on deeper examination there are many more applications. Not seen in many Wu forms is the Universal Healing Tao Forward Bend at the commencement of the form. This move can be applied to many combat situations. The most obvious application is a dodge for a high attack. This occurs when an opponent’s center of gravity is high with a forward moving momentum. The practitioner gets underneath the opponent’s center and follows the opponent’s forward momentum with a high shoulder throw. Alternatively this can be a dodge to a high attack and placing oneself under the arms of the opponent. The opening form can be described as including the four major forces or gates of Peng, Lu, Ji, and An. The Forward Bend includes rising arms, which involves a Peng force. This force can be applied to the opponent’s arms such as in a stranglehold or lock. Peng means that the power is amplified from the earth and the tan tien and has the power akin to a loaded spring being released. The rising arms can strike the elbows or forearms releasing the lock. The contact with the opponent’s arms is akin to the Ji force. 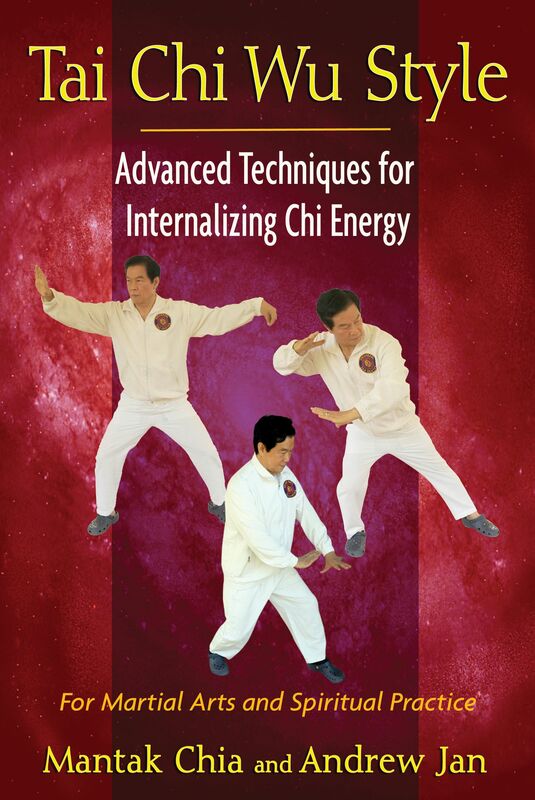 In our book Tai Chi Fa Jin the Ji force was explained using the Press as its outward gross manifestation. However in the more subtle interpretation it can be understood as the power from a rubbing force with close contact. From this rubbing close contact the opponent can be uprooted using the tan tien force, which can be visualized as a coin bouncing off a drum. In the downward movement of the arms, the hands return to the lower tan tien. They contain the Lu force or the power of emptiness. From the strike with the rising arms, the arms can fall, while grabbing the opponent’s arms and pulling him down. The last component of this form is an An force whereby a pushing or striking force is executed at the last moment. Hence in this Pull Down the opponent can be thrown as the final gesture. Forward Ward Off is the first component of the Bird’s Tail and occurs with the right arm and leg forward. There are several applications of the Ward Off. The first is a hip throw, whereby the rear arm is placed on the chest and the front arm placed behind the opponent. When a hip orthe forward leg is placed behind the opponent, he topples. Alternatively the Ward Off can be used as a strike/block with the rear hand acting as a secondary guard. An Elbow Strike can be inserted after the Ward Off and before the lower hand rotation. Some may argue that this is overreaching the form; however, I argue that this application emphasizes the versatility of forms arising from simple discharge movements of the tan tien. The outward manifestations of the Eight Forces can appear from seemingly nothing like an endless array of forms arising from formless water, which crystallize as the applications cited. This move uses the Chou force. From the right Ward Off the hands transit through the Seven Stars position. The Seven Stars can be used to trap a strike. The trap is used to control the elbow and hence breaks the opponent’s Iron Shirt posture--the arms are released centrally from this position as a one-inch strike with the front arm, while the rear arm imparts Jin to the trapped elbow. Once the structure is broken any attack is possible. A second application is a static one, whereby the arms merely move into a front guard position. In the Downward Parry the novice practitioner would focus on the hands. However, to the experienced adept much is concealed in this seemingly simple rotation of the waist with the palms downward. In this move one can focus on the left shoulder, which can be used as a shoulder or Kou strike from the posterior position as the adept rotates the waist. This application raises an important fundamental principle of Tai Chi Boxing. All outward Gates or applications can arise from simple rotations of the waist and expansive discharge from the lower tan tien. Thus the Eight Forces can be reduced to a trinity. There are three basic discharges from the tan tien: an upward, downward, or angular discharge. Whether the adept strikes with the hand, elbow, shoulder, or head is almost irrelevant. The same basic force is created in the tan tien. Hence practitioners should attempt to reduce all forms to ultimate simplicity. Simplicity is the key that the accomplished adept accesses to find true power in this internal art. Continue to ask yourself what is the simple power under each move and eventually you will learn the fundamentals of Tai Chi. Of course the Lower Hand Sweep can be used as a Lower Parry or Block, as shown below. Being aware of the myriad outward manifestations of each posture brings out the true spirit of the form. It also keeps the primary trunk and core strength of the lower tan tien active and ready to release its power at the blink of an eye.